When you travel with young kids, choosing a kid-friendly restaurant that also serves good food can be tough. 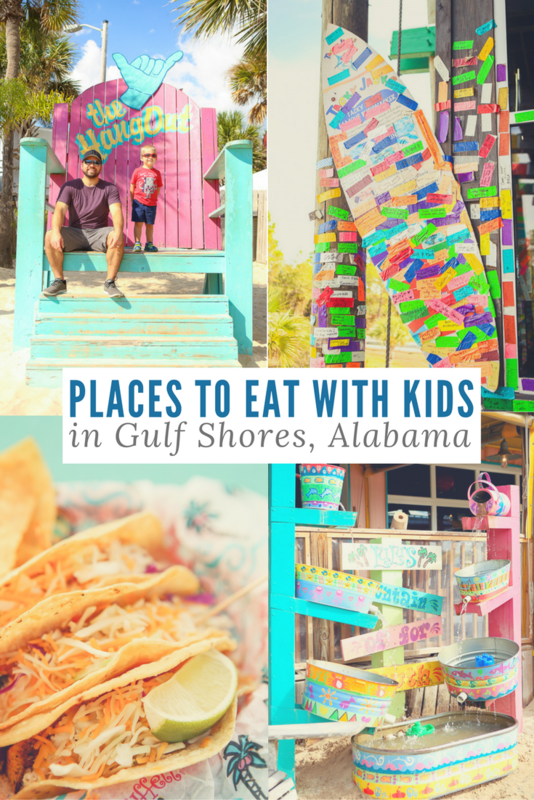 These three restaurants in Gulf Shores, Alabama aren’t just kid-friendly. They were designed with kids of all ages in mind and let you literally play while you eat. 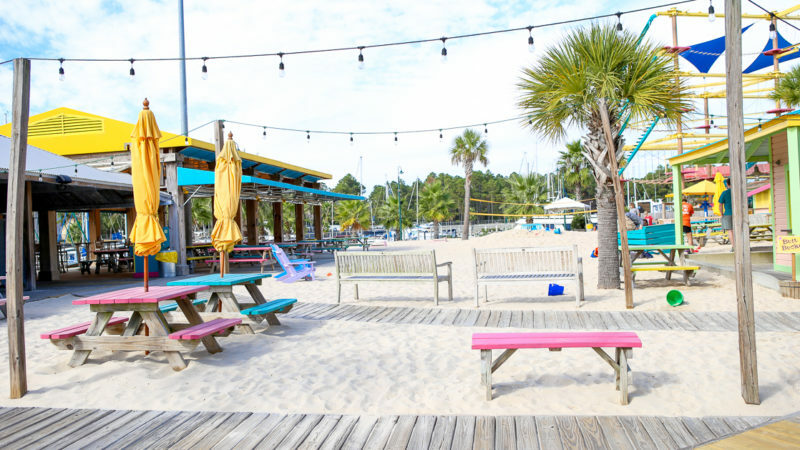 With playgrounds, ropes courses, and outdoor sand pits, any of these Gulf Shores restaurants would make a great choice for families. A couple of weeks ago my husband and I took our 3-year-old son on a quick family vacation to Gulf Shores, Alabama. 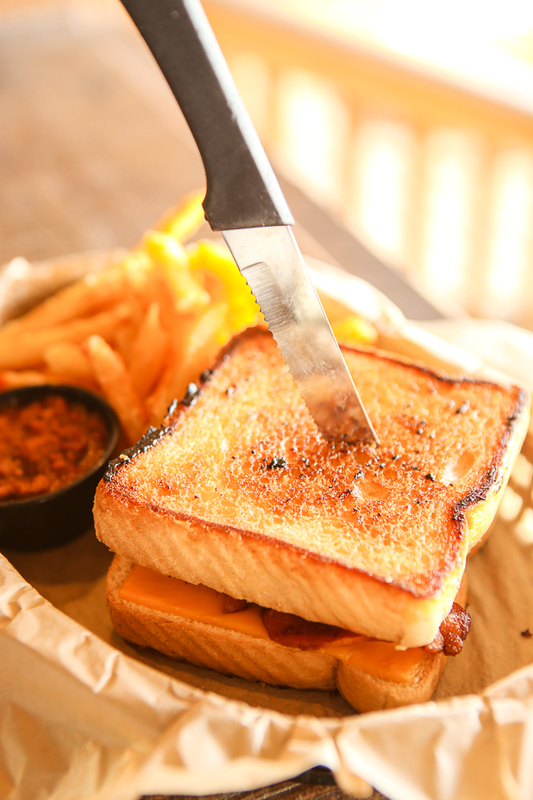 When we search for places to eat, we don’t just look for places that serve tasty food. Any restaurant we choose will also have to be kid-friendly. I was impressed to find these three restaurants in Alabama. They not only had good food but also had areas that our son could play while we ate. The Hangout is designed specifically as a place for people to come and hang out. The food is surprisingly good, but it’s the environment that really sells the place. You can feel it when you first walk in and see the collection of vintage lunch boxes on the entry wall. But it doesn’t stop there. 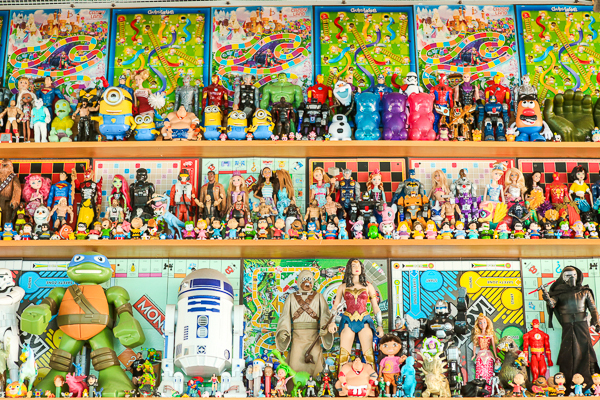 Each wall is covered with something different from action figures to vintage bandaid holders. We loved walking around each corner to see what the next wall held in store. 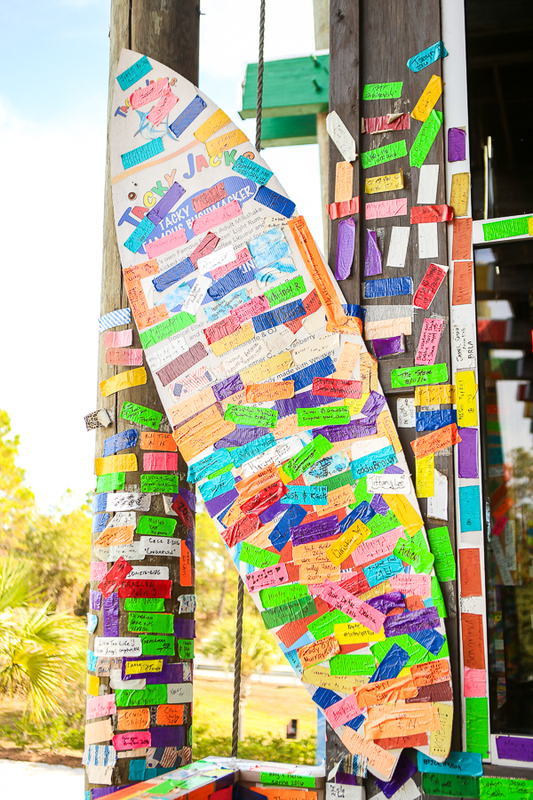 My personal favorite was the wish wall – a colorful wall full of tiny rolled up pieces of paper holding customers’ wishes. The Hangout provides the paper, and you make the wish. Like many in the Gulf Shores area, the restaurant is really an indoor/outdoor restaurant. The seating indoors bleeds into seating outdoors, that enjoys the gorgeous view of the gulf beach just a few steps past the parking lot. 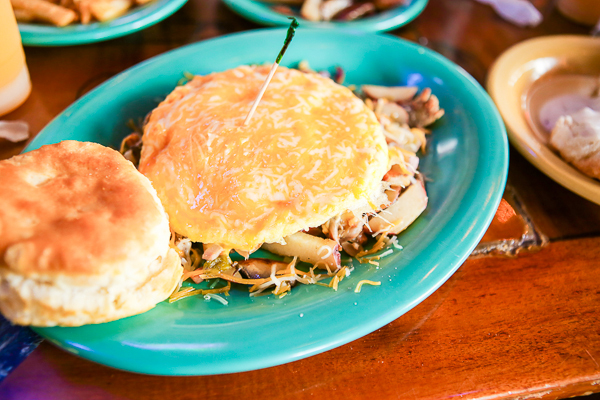 Order your food, then go for walk along the Alabama Gulf Coast. 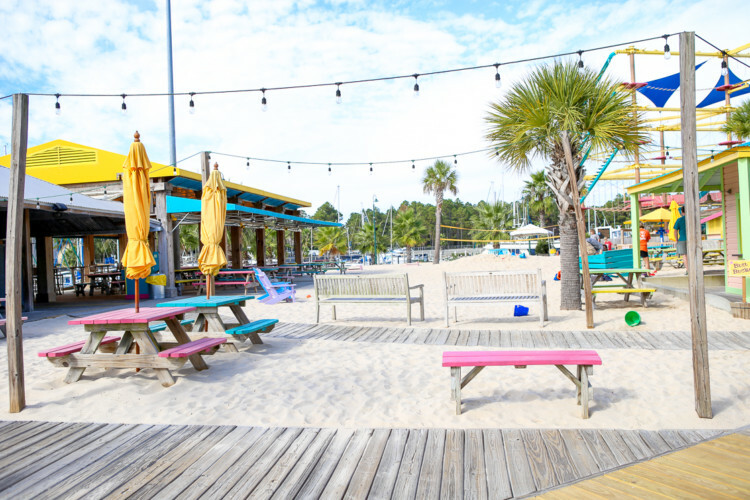 On the side perpendicular to the beach, The Hangout has created their own play area with a huge sand pit, oversized adirondack chairs, and a space for their hourly foam parties. But that’s not all! 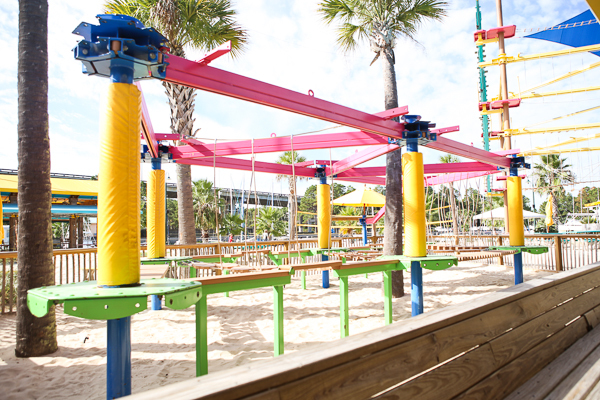 The Hangout prides itself on serving up fun for everyone. 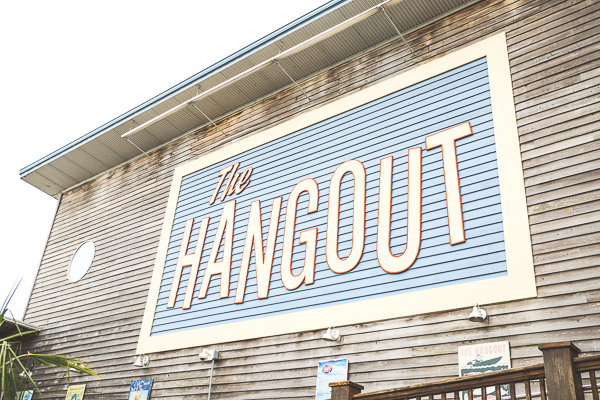 This list of 20 fun things to do at the Hangout right now proves just how much fun you can have. 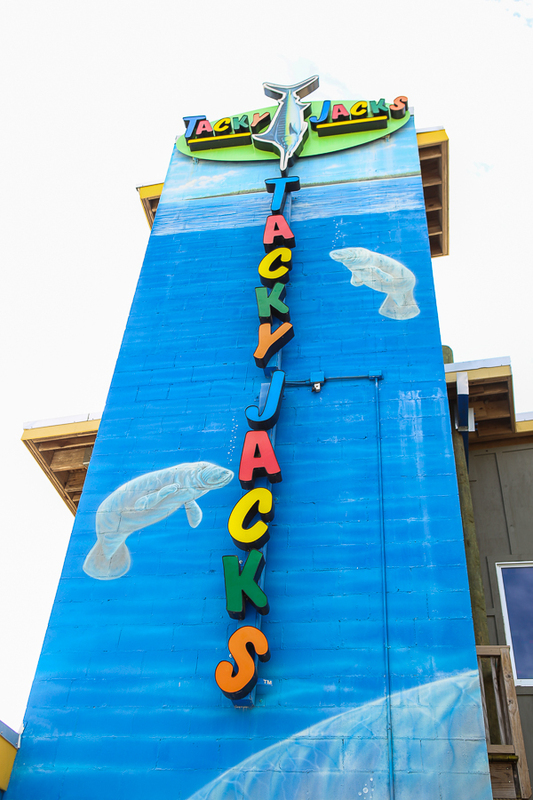 Tacky Jack’s is casual food in a casual environment. And when it comes to dining with young kids, casual is the name of the game. We ate there for breakfast and the food was good but nothing sticks out as being a must-eat. It was, however, the only place we ate in Gulf Shores where we could get truly crunchy bacon, my son’s current obsession. All of the other bacon we ate just wasn’t quite crunchy enough. After ordering, take your kids downstairs to enjoy a large sand pit, playground equipment, and even a pool table. Just be careful to keep a close eye on your kids as the play area is right next to the water, which can be tempting for the young guys. Once you eat, grab a piece of tape and Sharpie from the hostess desk to stick your name on any of the restaurant’s open surfaces. It’s tricker than it sounds as there is tape covering pretty much everything you can see. My son loved searching the entire restaurant for the perfect spot for our names. 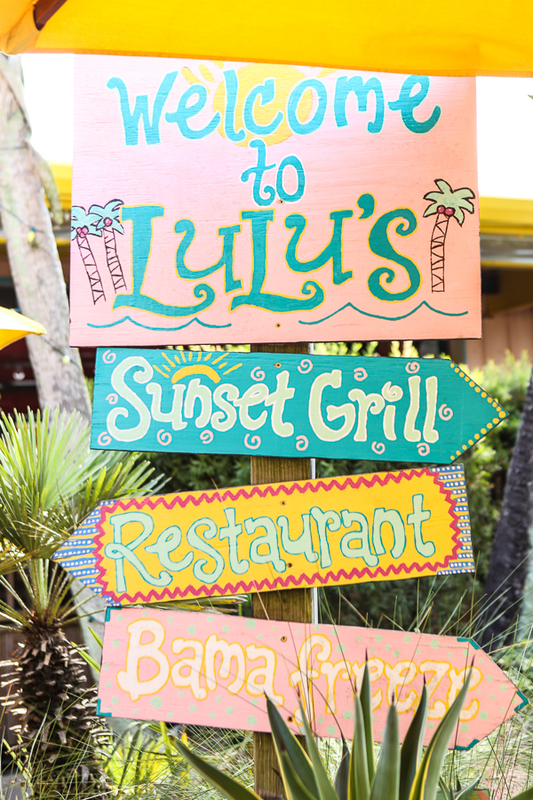 Lulu’s is the creation of none other than Lucy Buffet, the sister of Jimmy Buffet. 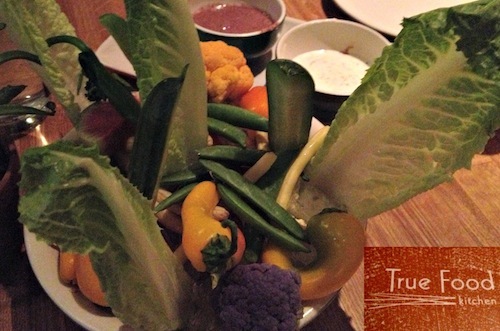 Of the three restaurants in this article, Lulu’s food was our favorite. From the perfectly crispy chicken fingers to well seasoned tacos, Lulu’s was somewhere we would actually return for the food and drinks alone. 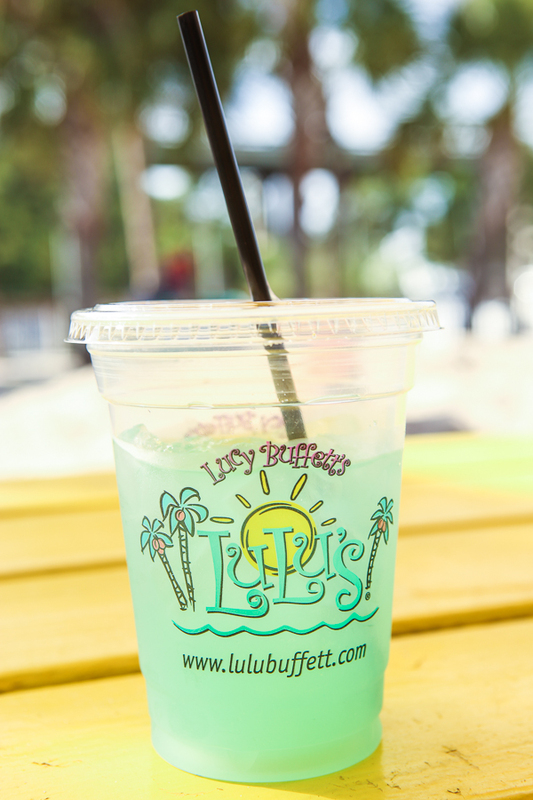 Get the blue lemonade if you’re a fan of slightly tart lemonades; it was the favorite lemonade I tried anywhere in Gulf Shores. And for once, I didn’t have to share my drink. My son was so happy with his blue raspberry dino (juice in a plastic dinosaur container). They also have a lion and monkey option if your kids aren’t quite as obsessed with dinosaurs as mine is. 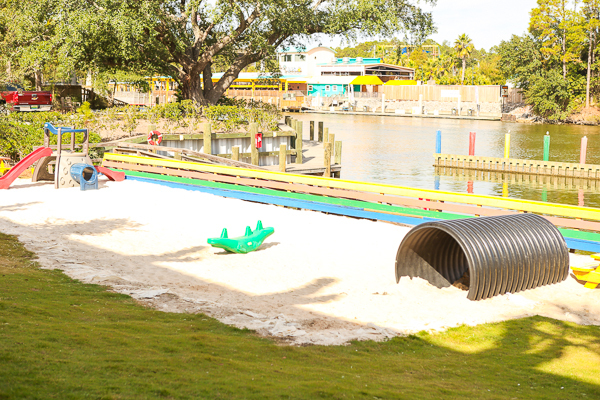 Lulu’s takes the places to play aspect to another level with two huge sandpits (complete with available sand toys), a water play feature, two ropes courses (one that’s $12/person for 48″ and up and one that’s $7/person for under 48″), an arcade, and a jellyfish jumper. It’s like a mini fun park you can enjoy before, after, or during your meal. Once my son saw the sand and water play area, we couldn’t get him back to our table to eat. Luckily, there are tables outside where you can eat and keep an eye on the kids playing. 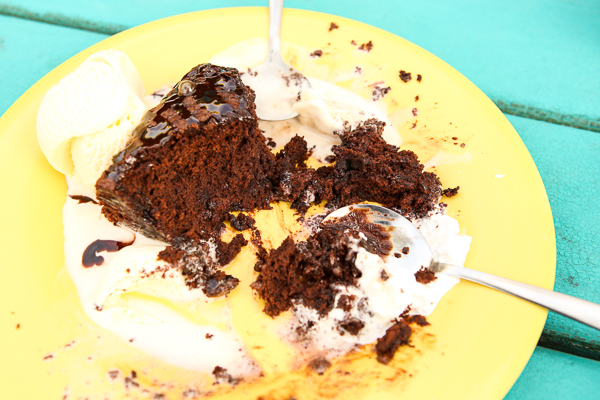 I mentioned food already but one more recommendation – ask for the dessert menu. They have freshly made popsicles in a variety of flavors that change regularly and the biggest brownie sundae I’ve ever seen. My husband and I split it, and we still couldn’t finish it. 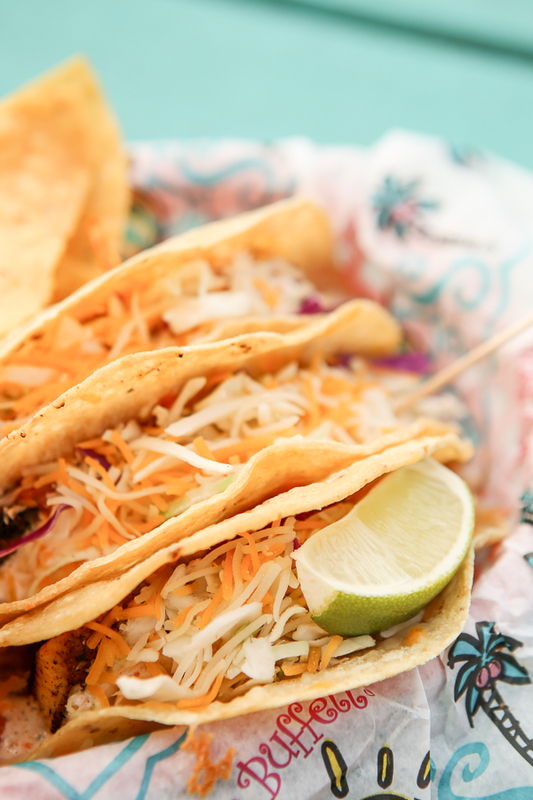 What’s your favorite place to eat in Gulf Shores? 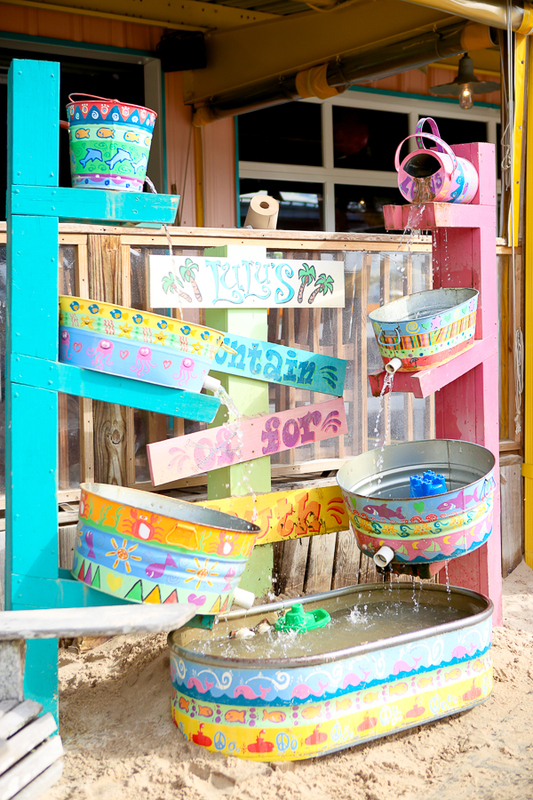 Thank you for the wonderful article on kid friendly dining options in Gulf Shores.